Halifax, Nova Scotia-based GoGold Resources (TSX: GGD) is dreaming big for 2014, after announced Tuesday it plans to make an $11-million bid to acquire Animas Resources Ltd. (TSXV: ANI) of Vancouver. The proposed take over would replace a previously announced $5-million deal to purchase Animas subsidiaries that held mineral rights to the Santa Gertrudis gold mine in Sonora, Mexico. GoGold CEO, Terry Coughlan, said the new offer allows the firms to own 100% of Santa Gertrudis without having to pay any royalties as previously provided under the former bid. If the transaction is successful, Animas shareholders will receive seven cents in cash and 0.0851 of a GoGold common share for each Animas common share. GoGold said the premium to Animas shareholders is 142% based on the 20-day volume-weighted average share prices of both companies. GoGold also intends to acquire all Animas warrants by offering one GoGold common share for each 94 cent of in-the-money value of the Animas warrants. The proposed deal, which is subject to regulatory approvals, also includes the 27,000-hectare Desierto exploration property in Sonora. The news confirms expectations of a global increase in deals for 2014. Last month, Ernst & Young said that most companies see he global economy improving, with 55% of miners focusing on growth — compared to only 38% by the end of 2012. 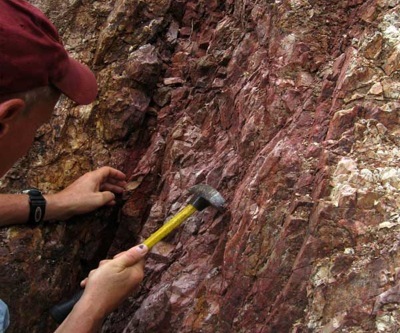 Image: Oxide ore at Santa Gertrudis, courtesy of Animas Resources.